Do not adjust the steering wheel when your vehicle is moving. Make sure that you are sitting in the correct position. See Sitting in the Correct Position in the Seats chapter. Make sure that you are sitting in the correct position. Refer to Sitting in the Correct Position in the Seats chapter. Use the control on the side of the steering column to adjust the position. telescope: press the front or rear of the control. When you switch the ignition off, the steering column will move to the full up and forward position to allow extra room to exit your vehicle. The column will return to the previous setting when you switch the ignition on. You can enable or disable this feature in the information display. See General Information in the Information Displays chapter. You can save and recall the steering column position with the memory function. Refer to the Seats chapter. Pressing the adjustment control during memory recall cancels the operation. The column responds to the adjustment control. The steering column sets a stopping position just short of the end of the column position to prevent damage to the steering column. A new stopping position sets if the steering column encounters an object when tilting or telescoping. 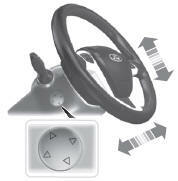 To reset the steering column to its normal stopping position: 1. Press the steering column control again after encountering the new stopping position. 2. Continue pressing the control until it reaches the end of the column position. A new stopping position is set. The next time you tilt or telescope the steering column, it will stop just short of the end of the column position.